View More In Sound Therapy - Page 4. THE ULTIMATE INTRODUCTORY SOUND HEALING SET! Experience the Stress-relieving properties and good vibrations of the Ohm Tuning Fork, and Treat yourself at Home with Ohm! Package includes CD, Ohm Tuning Fork (136.1 hz), Activator (latex-free), and detailed instructions, photos and illustrations demonstrating Use! At last, a perfect introductory package so everyone can benefit from the many health benefits of Sound Healing. 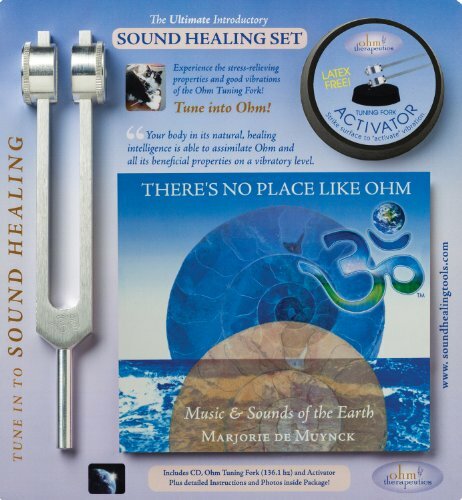 Adults, Children and Pets love the playful interaction and good vibrations of the Ohm Tuning fork plus the soothing Music and Sounds of the Earth! Tune in to Ohm! 1) An introduction to the stress-relieving properties of the Ohm Tuning Fork plus Music in the key of OhmTM! 2) Easy instructions for use accompany CD with printed insert illustrating treatment applications suitable for the entire family, even pets! 3) Four easy Self-Treatment applications, plus additional recommendations for relief of headache, sinus and chest congestion, cramping muscles, repetitive stress injuries and more! Made in the USA from space grade aluminum, Ohm Therapeutics Tuning Forks are fully guaranteed to stay in tune. There's No Place Like Ohmis Musical Medicine; it is immediately relaxing, a beautiful Sound Odyssey that allows you to resonate and journey with the Ohm tone like never before. Many chant the Ohm mantra, however, this CD was created without human voice, in the musical key of Ohm and focuses instead on the voices heard in nature through wind instruments and animals sounding. Tantric Buddhist scripture tells us that Ohm is the most powerful vibration. Listen for relaxation, stress reduction, while meditating, practicing Yoga, and as an aid to help promote deep and restful sleep. Featured instruments include Native American Flute, clarinet, didgeridoo, harmonica, Afrikan kora and Middle Eastern oud. If you have any questions about this product by Lemniscate Music, contact us by completing and submitting the form below. If you are looking for a specif part number, please include it with your message.